Eco Evolution BlogBuilding an Insect Hotel for Winter Hibernation. An insect hotel improves a garden’s biodiversity and provides refuge for pollinators and pest controllers. Insects might not look like particularly significant visitors to your garden, but they’re vital to keeping the ecosystem working. If you want to help them get through the hard times or give them somewhere to breed, provide them with their own place to stay. With the cooler weather fast approaching now is the time to consider providing suitable hibernation habitat for beneficial insects that pollinate trees and vegetable crops, and control pests. After all, you will need them when the frantic planting season begins next Spring and what better way to start the season than having your own little colony of insects to help you on the way. Our gardens are home to a wide range of insects and the average garden could hold over 2,000 different species of insect. By creating the right habitats we can increase the number of beneficial insects in our gardens. Pollinator habitats can attract domestic honeybees, bumblebees, solitary bees and other wild beneficial insect species. These beneficial species include many different wasps, beetles, lacewings, hoverflies, ladybirds and earwigs and prey upon the kinds of insects such as lice and mites that damage plants and hence aids pest control. By providing the correct habitat we can contribute to their conservation. 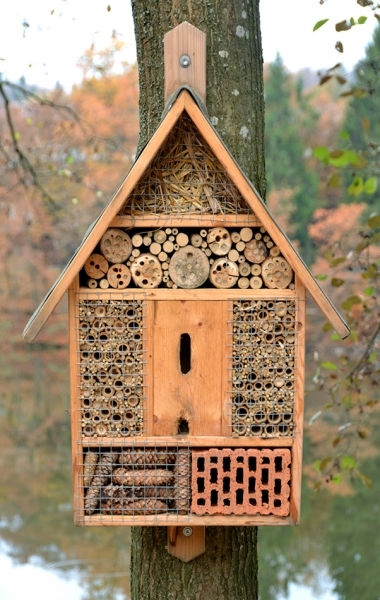 There is no standard design for an insect hotel. 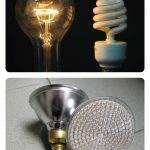 Just design with your available materials — preferably recycled and natural materials such as old pallets, clay pots, clay pipes, bricks, carpets etc. Insect hotels come in many shapes and sizes but to be effective they need to have many small holes and cavities that insects can crawl or fly into. Many invertebrates like cool damp conditions, so you should build your insect hotel in semi shade, by a hedge or under a tree. Putting the insect hotel close to other wildlife features such as an overgrown hedge, a shrubbery or a pond will make it easier for small insects to find it. Remember, not all creatures like the shade especially solitary bees so make sure to place their part of the habitat facing the sun. 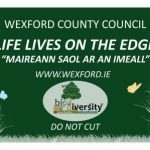 From my experience working with my local Tidy Towns group, the Green Schools Committee and talking to other groups the most common way to build an insect hotel is to use old pallets and fill the gaps with a variety of recycled materials to attract a large and varied number of creatures. No need to go more than five pallets high for the insect hotel with the bottom pallet upside down, this should create larger openings at the ends which can be used for a hedgehogs and frogs. 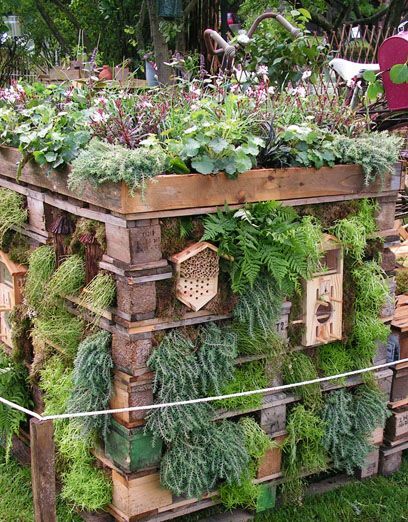 If you only have room for something on a much smaller scale there are several ways you can use recycled materials and turn them into suitable habitats or there are a range of FSC certified insect hotels available at most garden centres. A simple insect hotel can be made from a collection of hollow stems, twigs and cones packed into a plastic bottle with the end cut off. Several hotels could be placed in different positions around the garden such as on the ground amongst vegetation, next to a wall, fixed to a post placed in a hedge or hanging from a tree. Another easy design is to take a bundle of bamboo canes or other twigs and tie them together with a piece of string. Hang up the bundle under the branch of a tree or to a railing and the insects will start to move in. 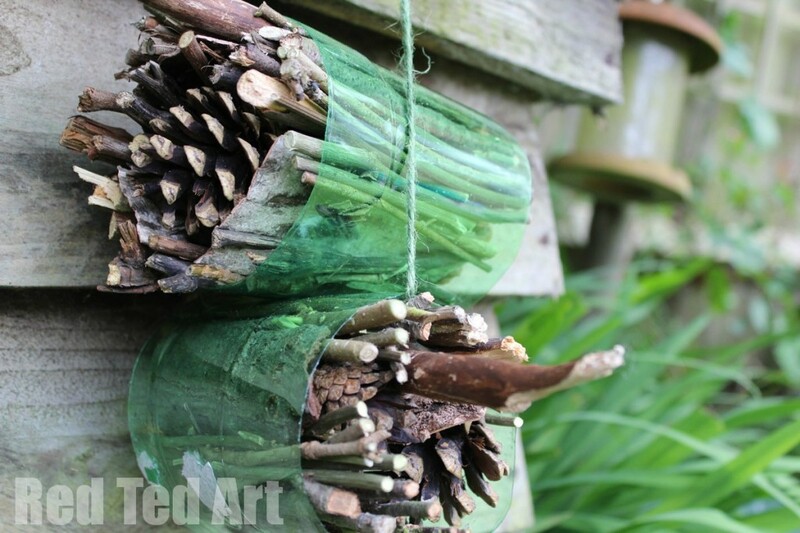 Use old pots, twigs, rolled up cardboard etc to create a simple but interesting looking insect hotel. What types of habitiats are needed to conserve our pollinators and other insects. Dead wood is an increasingly rare habitat because in recent times we have become excessive with neatness in our gardens, parks and amenity areas. It is essential for the larvae of wood-boring beetles such as the stag beetle because they feast on the decaying wood. Place at the base of your hotel so the logs stay nice and damp and mix with other decaying plant matter to attract centipedes (which devour slugs) and other woodland litter insects such as millipedes and woodlice (which will provide a welcome source of food for birds). This is also a great spot for garden spiders.It also supports many fungi, which help break down the woody material. Holes for Solitary Bees: There are many different species of solitary bee and all are excellent pollinators. The female bee lays an egg on top of a mass of pollen at the end of a hollow tube, she then seals the entrance with a plug of mud. A long tube can hold several eggs. 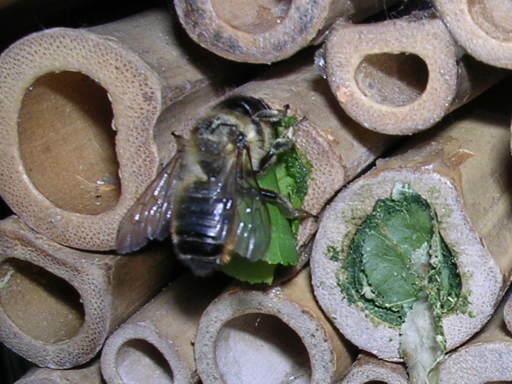 Hollow stems, bamboo canes or holes drilled in blocks of wood make great habitats for the solitary bees. When it comes to drilling holes in wood, take into consideration the fact that different bee species are drawn to different sizes of holes for shelter and egg-laying and remember to use wood that is preservative free. 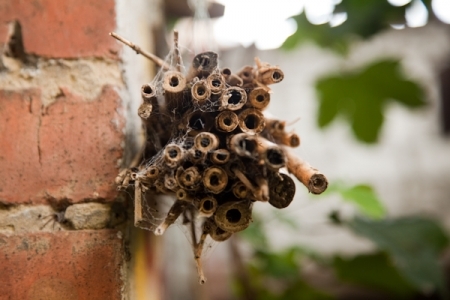 As mentioned above you can make a home for solitary bees by collecting hollow stemmed canes and placing them in plastic bottles or lengths of drain pipe. You can also build a wooden shelter similar to a bird box. Solitary bees like warmth, so place your habitat in a sunny spot. Straw and hay: These provide many opportunities for invertebrates to burrow in and find safe hibernation sites. Dry Leaves: Provides homes for a variety of invertebrates as it mimics the natural conditions found in forests. Loose bark and decaying wood: Beetles, centipedes, spiders and woodlice all lurk beneath decaying wood and bark. Woodlice and millipedes help to break down woody plant material. They are an essential part of the garden recycling system. Lacewing homes: Straw, dried grass or rolled up cardboard is just the material for a cosy lacewing habitat. While lacewings may be beautifully intricate to look at, they are truly the gardener’s best friend, devouring aphids and other pests such as scale insects, many types of caterpillar and mites. 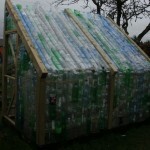 Place the straw or cardboard inside an old open-ended plastic bottle to prevent it turning soggy. 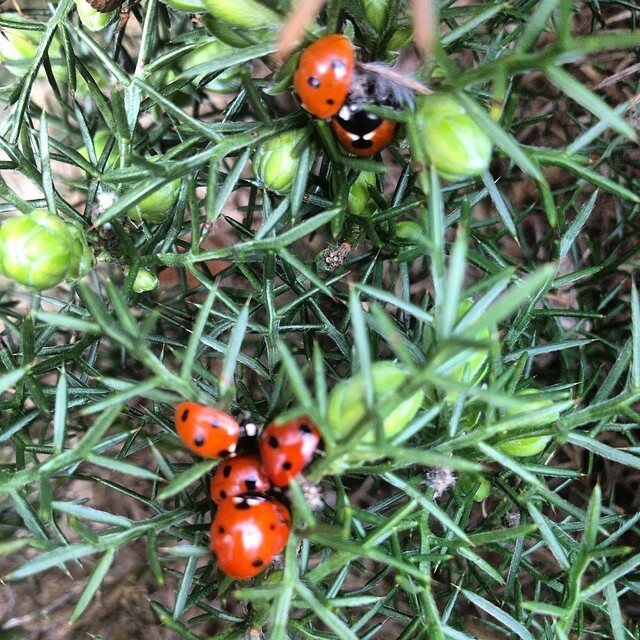 Ladybirds: Ladybirds and their larvae are fantastic at keeping aphids at bay. 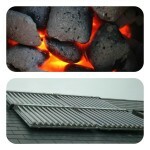 The adults hibernate over Winter and need dry sticks or leaves to keep warm and dry. Bumblebees: Every Spring queen bumblebees search for a site to build a nest and found a new colony. An upturned flowerpot in a warm sheltered place would be an ideal habitiat to attract the queen bumblebee to your garden. Bees, butterflies and some other insects sometimes find their way into your house to hibernate well away from the winter chill! This can mean they wake up when you put the heating on, so if you find one hiding in your house, try moving it to a cool, dark place to encourage it to go back to sleep until spring. If you’re feeling creative and want to build a five star insect hotel take a look at these for some inspiration. Remember simple things like leaving a pile of logs or stones in a corner of your garden or just leaving fallen leaves on the ground will provide natural habitats for insects, invertebrates and pollinators which in turn will help to enrich the local ecosystem and ensure your garden is as productive as it can be. 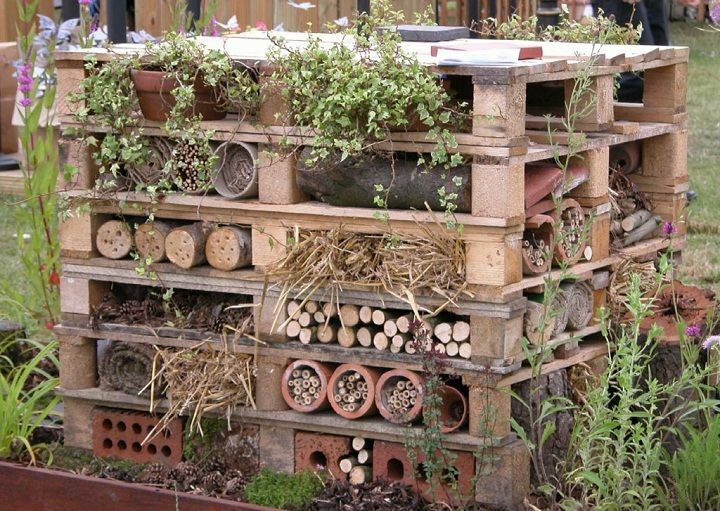 Have you built an insect hotel in your garden? 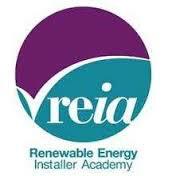 Have you seen an increase of insects, pollinators etc since building it? 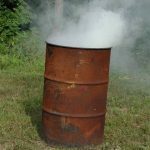 If you’d like to know more about why you should consider building a bug hotel Greensideup gives three great reasons why we need to build more bug hotels. Chooseday’s Choice! 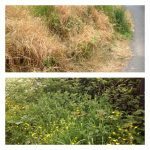 ~ Herbicides – yes or no? 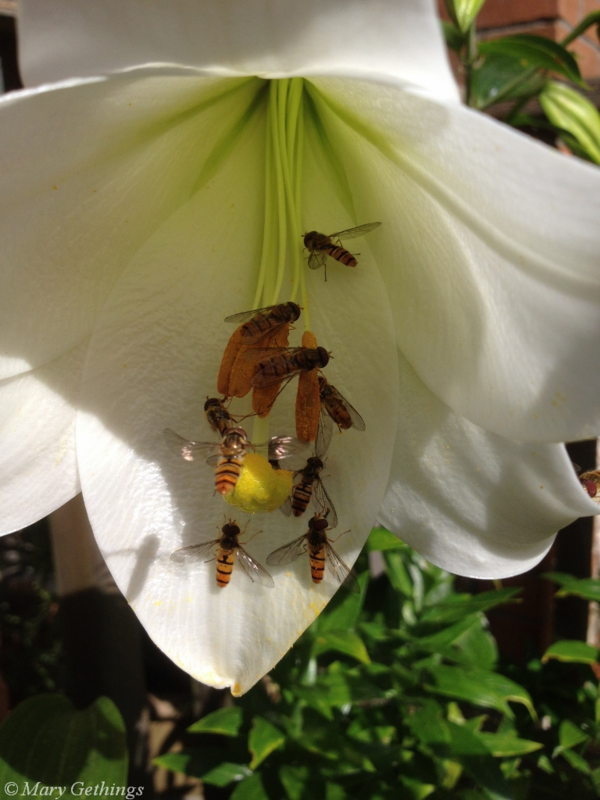 A fantastic post and a timely reminder that we need to encourage pollinators and insects into our gardens especially now with the rapid decline in the bee population. 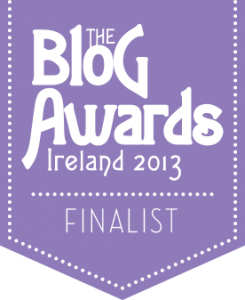 Definitely giving this a go ….must dash to see what I can find. Thank you. We may all try and do our bit for our declining bees and pollinators. They’re so easy to build and a great way to recycle bits and pieces. I’ve noticed a marked increase in bees etc in my own garden over the last few years…I’m putting it down to the fact that my garden isn’t as neat and tidy as it used to be (overgrown really) and as a result there are loads of natural habitats forming with leaves and debris left on the ground. 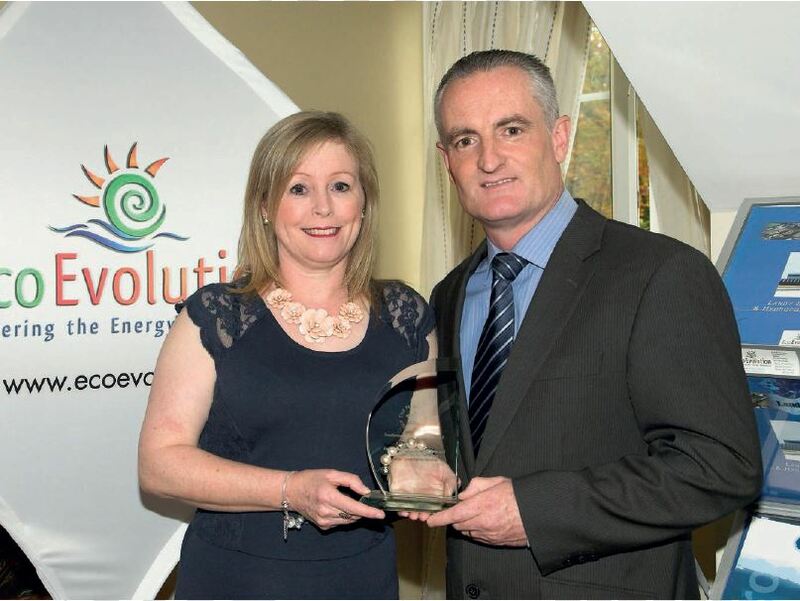 Some beautiful examples there Mary and timely. Spotted a solitary bee in the sitting room last night (the room used to be a cow shed) looking for somewhere to settle for the winter. Thanks Dee. Spotted one in our sitting room this morning too. The examples on the link are amazing. 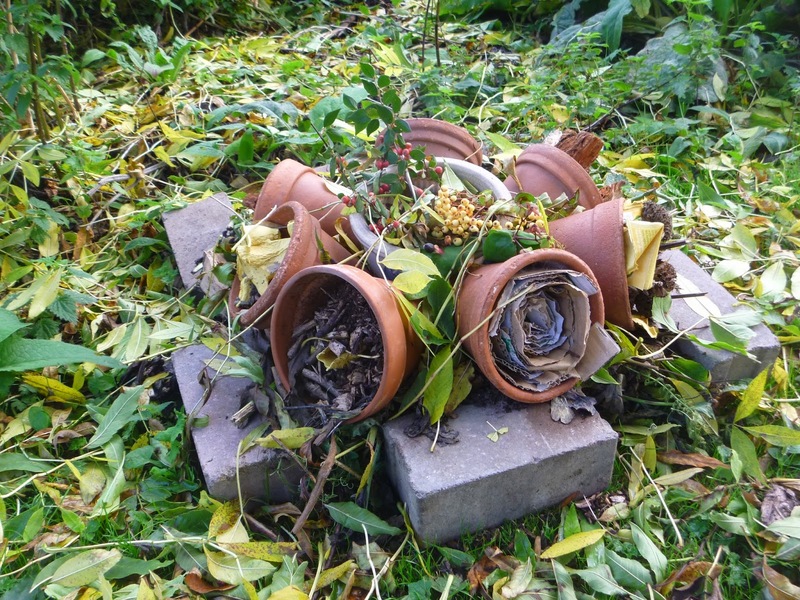 Our insect accommodation wouldn’t be quite 5 star ….. piles of twigs, stones, old pots etc lying around the garden. Does the trick though. I’ve seen a big increase in insects etc since we stopped having a really neat and tidy garden. I just tell visitors that it’s an insect friendly garden now.